Look Up! Every year on Halloween night we can see the Pleiades star cluster also known as the Seven Sisters, almost overhead at midnight. They signal not only the night of the dead, but to some even the end of the world itself. The days at the end of October and the beginnng of November, when the Seven Sisters reign high overhead at midnight, are also considered by many to be hallowed days. The Seven Sisters reign over the Days of the Dead. Shown at midnight during late October / early November for mid-Northern latitudes. The dashed vertical red line marks the meridian, an imaginary line running from due South to due North. The Pleiades or Seven Sisters star cluster can easily be seen nearly overhead at midnight on Halloween. 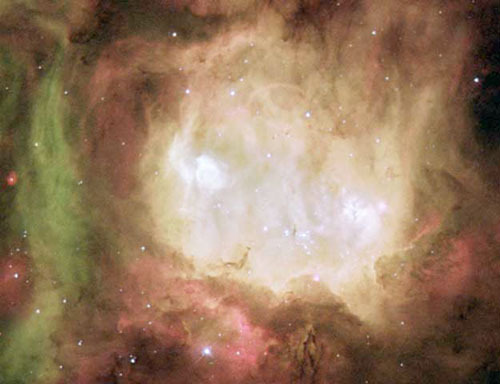 The inset shows a binocular view of the star cluster. Seven Sisters? Note: The three stars of the belt of Orion point down (SE) to our brightest star, Sirius, and up to the reddish star of enlightenment, Aldebaran. 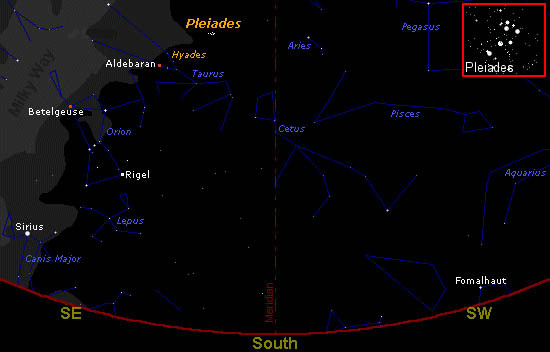 Aldebaran appears to be part of the V-shaped Hyades and lies southeast of the Pleiades. Betelgeuse is the reddish shoulder star of Orion. Look Up! Halloween at midnight is quite a sight, but to some it may cause a fright! Keep reading. Many peoples believed that a great ancient cataclysm occurred when the Pleiades were overhead at midnight, such as the great biblical flood or the sinking of Atlantis. The belief was so widespread that in Mexico the Pyramid of the Sun in Teotihuacan was oriented to the setting of The Pleiades as were all of the city's west running streets. And in ancient Greece several temples were lined up with the rising and setting of the Seven Sisters. The Aztec and Maya not only believed that the world would come to an end on one of these Pleiades overhead-at-midnight nights, but were convinced that the world had already been destroyed and recreated 4 times on just such a night. Should we rename them the Seven Sinister Sisters? These days the Pleiades culminate, reach their highest point at midnight, 12:00am PST November 20. Each Halloween Arcturus is a Halloween ghost of the summer sun just before sunrise and just after sunset. Bright and flashing Arcturus can be seen in the west at nightfall until it sets at 7:45pm. Orion the Hunter fully rises in the east around 10:45pm guiding you to the already risen Aldebaran and the Pleiades. Look Up! Allow these hallowed celestial bodies to energize your spirit and fill you with awe and wonder. The Pleiades are indeed potent. It is said that they direct the Light of God toward Earth. Perhaps as this occurs at critical times in the Earth's evolution, that which is not in alignment with the Light of God perishes. All-Hallowsmas was the name given around the end of the first millennium to All Saints Day, November 1, and All Souls Day, November 2. October 31 was "All Hallowed's Eve" or Hallow'e'en. The roots of these hallowed days go back to the Celts who celebrated Samhain at the end of October and the beginning of November. This was and is the time when the veils between the spirit world and physical world thin, a time when ghosts and spirit beings walk the Earth. It used to be a scary time, a time when people got frightened by the spirits and a time when they tried to hide and confuse the spirits by wearing costumes. Today, few people seem to see these spirit beings. Today, this is a time for children to dress in costumes and play trick or treat. It is also a time to honor our ancestors, release the old, foresee the future and understand death and rebirth. The Mexican culture embraces the Festival of The Day of the Dead, as a time of happiness, remembering, and much feasting. They believe that family members who have died return to their grave sites, so flowers and gifts are placed there. The date of this festival varies from town to town, ranging from the nights of October 31 through November 2, so the name in its plural form Los Dias de los Muertos is often used. Celebrate The Days of the Dead. Look Up! Ponder the Pleiades. Create an altar and take the time to hallow the life of the spirit in and out of form!